The Soldier is essentially a highwayman; however, he is usually encountered with two others all dressed as Imperial guards. They aren't actually Imperials (as evidenced by the three naked corpses near them, and the fact that they aren't dressed properly). He will state that it is a restricted area and that you must pay a 100 gold fine. You can pay the fine, say that you don't have enough money, or tell him that he can have the money if he can take it from you (this option obviously causes combat). If you have joined the Imperial Legion, a dialogue option will become available stating that you know they're not Imperial soldiers, which will result in them becoming hostile. 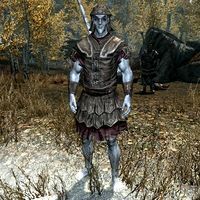 Conversely, if you have joined the Stormcloak rebellion, you can taunt the soldiers, saying "it's only three of you imperials against one stormcloak...that hardly seems fair" which will result in them becoming hostile. This Soldier stands beside the two other "Soldiers". 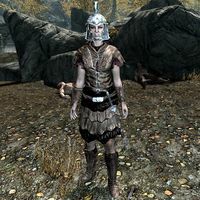 She is passive unless attacked or you pick the option to engage in combat with the orc leader. This Soldier stands beside the two other "Soldiers". 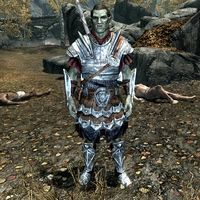 He is passive unless attacked or you pick the option to engage in combat with the orc leader. This page was last modified on 5 September 2014, at 04:25.